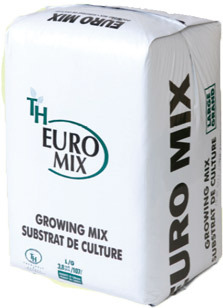 Euro-XCC All-Purpose | Theriault & Hachey Peat Moss Ltd.
An economical all purpose professional growing mix without any perlite or vermiculite. It contains extra coarse grade sphagnum peat moss (100%) which has been specially screened to remove the fines and add small peat chunks, therefore increasing the air porosity. It also contains calcitic lime, dolomitic lime, wetting agent and starter fertilizer with trace elements.